Does anyone remember when the starting rotation figured to be a weak spot for the Rangers in 2014? That sure seems like a long time ago. In another example of you-can't-predict-baseball, the offense has mostly struggled out of the gates, while the starting rotation has actually been a bright spot. With Yu Darvish at the top, you can't help but figure he provides a strength, but heading into the season, many still weren't sold on Martin Perez. Perez has opened the season by inducing 10 double play grounders in his first three starts, good for the most in all of baseball. The next closest? Jeff Samardzija, with 7. Robbie Ross, through his first two starts, didn't allow many runs, but walked more than you'd like to see by issuing 8 free passes, 6 coming in his April 9 start in Boston. Then, Robbie went out last night and induced 16 ground-ball outs in 7 2/3 innings, while walking none. While he did hit Brad Miller twice, he looked calm and confident on the mound, and controlled the pace of the game from the very first inning. 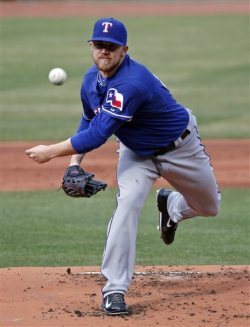 Colby Lewis returned on Monday. He deserved better from a results standpoint, but he also looked like a guy that could be huge for the Rangers all season, even though the defense behind him gave up a 7-run inning on three errors. There was a time during Spring Training that it appeared we would be faced with the prospect of watching Tommy Hanson and Joe Saunders each make a start every fifth day. Instead, Saunders made only one start, and it appears he won't get another, as pitchers like Ross and Lewis have stepped up. Even Tanner Scheppers, to an extent, has stepped up. Although the results aren't there, he's kept the Rangers in the games he's pitched recently, and without a 5-run inning against Houston, would look like a great option right now. In other words, when Matt Harrison comes back, likely by the end of the month, the Rangers will be needing to decide between Robbie Ross and Tanner Scheppers, with one staying in the rotation, and the other going back to the bullpen. While Ross appears to have the inside track right now, it's baseball, and things could certainly change after another turn through the rotation. It's a fantastic problem for the Rangers to have, especially when you consider that somewhere down the line, Derek Holland is expected to return, and perhaps this is the season in which the Rangers don't need to go out and sign Roy Oswalt, or trade for Ryan Dempster or Matt Garza. Or even Mike Adams and Koji Uehara, because as the starting rotation gets stronger, the bullpen figures to do the same. Then we have the matchup tonight, when Yu Darvish takes on Felix Hernandez -- the Cy Young favorite against the Cy Young winner. And yet, while our guts tell us to expect a pitching duel, the Rangers have hit Hernandez hard, and Darvish has had his own problems with the Mariners (4.78 ERA). Remember Rangers 10, Tigers 4 on May 16 of last season? Darvish and Verlander faced off, and neither looked particularly sharp as their offenses went off early and often, but a 7-run 3rd inning by the Rangers proved to be too much for Verlander to overcome. And yet, it still wouldn't surprise me if we see the Rangers offense struggle to give Darvish any kind of run support. If they do, however, then maybe the Rangers will get the best of King Felix yet again. That would get the Rangers back above .500 for the first time since being 2-1 before the series in Tampa. For all of the concern over the pitching heading into the season, the pitching has kept the team afloat, and it's been the offense that has struggled. Adrian Beltre is on the DL until April 25, and Jurickson Profar won't get to make his foray into being an everyday player until around midseason. So it's at least nice to think that, should this offense break out of the early funk for any extended period of time, this 2014 ball club, hovering around .500 in the early-going, could look closer to dominant than we thought we'd see before the All-Star break -- because of the pitching depth, if you can believe that.